Because of increases in postal and packaging costs, we have had to increase the shipping and handling charges for our publications and other products. Thanks for your understanding. 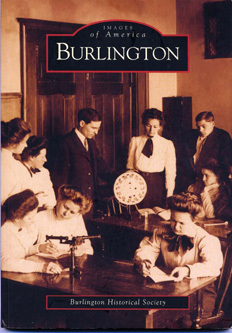 The Society's book, titled "Burlington," is part of the Images of America series published by Arcadia Publishing Co. of Mt. Pleasant, South Carolina. The book makes local history available to everyone. A meander through the pages will bring revelation for the young folks and both recollection and reminiscence for the young at heart. Two samples from the set of 12 postcards are shown to the left. Set includes: The Water Towers, Lincoln and Cooper Schools, Chestnut Street "Loop," Echo Park Dam, Pine Street, Corner of Chestnut & Pine, etc. BURLINGTON About 230 photographs from the Society's collection are featured in this 128-page soft-cover book, together with captions describing the scenes and giving some history of the subjects shown in the photographs. A short historical sketch of Burlington introduces the images. Copyright 2005.